The news: NASA&apos;s Cassini spacecraft zoomed past Saturn&apos;s smoggy moon Titan on Wednesday to check out its atmosphere and vast northern seas. The 10-year mission has helped researchers build some of the most complete topographic models of another moon in our solar system we&apos;ve seen. As the second largest moon in our planetary neighborhood, Titan is also the most Earth-like body we&apos;ve encountered. During the flyby, the craft bounced radio signals off Titan toward Earth, where a NASA team on the ground received them. As the signals passed through Titan&apos;s thick atmosphere, they collected information about the moon, from the temperature and thickness of its chemical envelope to the nature (liquid? solid? slush?) of its surface. Scientists have been assembling this information since the mission began. This most recent trip will help verify the content of the gas in the moon’s atmosphere. What we already knew about Titan: Like our home planet, Titan is surrounded by a dense layer of swirling gases that create surface features — such as dunes and canyons — similar to those we have on Earth. Titan is also the only body we know of with liquid lakes and flowing seas. Too bad it&apos;s way too cold to host us. What Cassini is helping us learn: Scientists have guessed that Titan&apos;s waterworld runs on liquid methane, a colorless, odorless gas found in our own atmosphere. Without any direct observations, however, they haven&apos;t been able to confirm this hypothesis. Researchers hope their most recent visit will help fill in the blanks. "If the data from [Wednesday] morning is good enough, it will tell us what these liquids really are," said Cassini radio science team member Essam Marouf of San Jose State University. 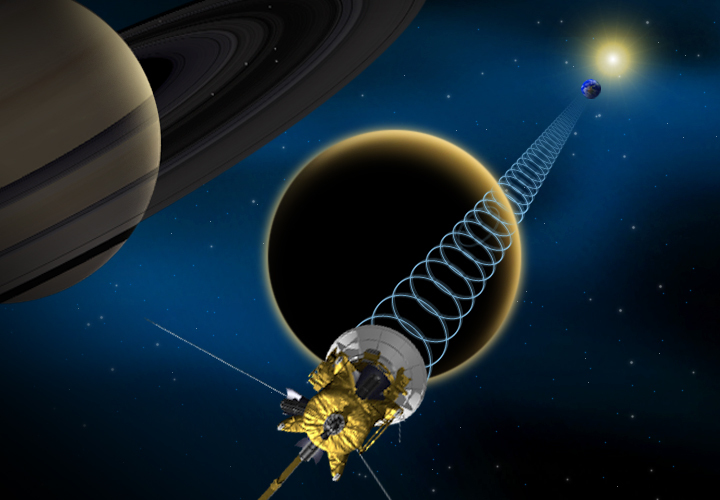 How the radio signal works: After shooting toward Titan Wednesday at a blistering 13,000 miles an hour (3.5 miles per second), Cassini edged as close as 2,000 miles away from the moon&apos;s lake-dotted surface. Once it arrived, scientists on Earth beamed a radio signal toward the craft. As the signal passes through Titan&apos;s atmosphere, it records details about differences in temperature and density and blasts that information back to Earth. The NASA team will be studying their findings over the next few days. They&apos;re set to report back next week in the Netherlands.